From new customization options to revamped favorites, new tools and features are being tested every week on popular social networks. And while you should never get too caught up in the details, it’s important that you know how these changes can affect your strategy. After all, your profile is the entry point for your audience. Any updates made to its design, layout, or content can have a positive or negative impact on your community. Earlier this month, Twitter announced some minor changes designed to enhance both your and your followers’ experiences. The first change, an updated web font, is intended to improve speed and readability on the platform. While this doesn’t impact your day-to-day activity, it’s worth noting because content moves quickly on Twitter. Any improvement that helps people more easily notice your tweets is a good thing. Twitter also introduced new buttons that make it easier for people viewing your profile to send you tweets or Direct Messages. Although this process wasn’t very difficult to begin with, the new buttons target those users who come across your profile rather than discovering your content within their timeline. Clicking “Tweet to” will automatically open up a new tweet with your @username already at the beginning. These updates, while minor compared to the total profile overhaul earlier this year, can still influence other design and content choices you might be planning. Here are a few examples of brilliantly branded Twitter profiles and how they’ve integrated some of the network’s lead and supporting features. The header image you choose for your Twitter Profile should reflect your brand or current campaign. Of course it’s important to maintain some consistency across platforms, so we don’t recommend changing your header every day. That said, it’s an important marketing asset and great care should be taken when selecting your image. It’s tempting to want to cram as much detail into your header as you can, but in these limited spaces, often less is more. Canva, however, struck the right balance with its collage layout, brilliantly displaying examples of its designs without distracting from the rest of its profile. 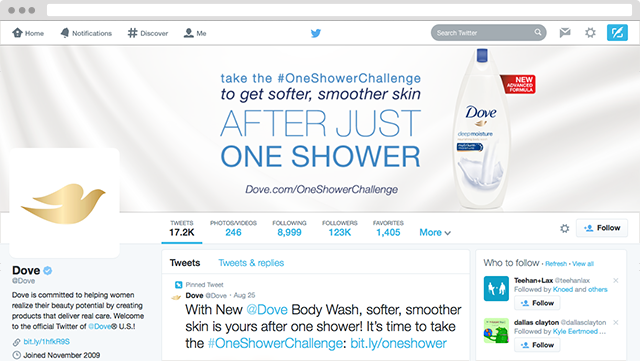 Dove’s campaigns usually focus on eliciting emotion and creating experiences, but the brand’s current header takes a more straightforward marketing approach. What we love about this is the background. Not only does it mesh well with the brand’s simple and natural essence, but it helps viewers focus on what’s really important: the call-to-action. Anyone who follows you on Twitter, or on any social network, knows that they’ll be shown product information and branded content. What stands out about Livefyre’s header is that the brand dedicated this prime real estate to its team. 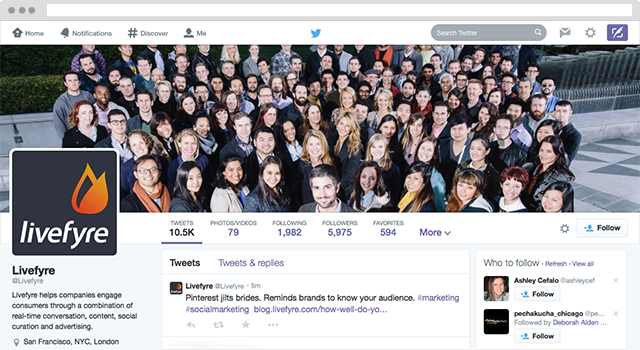 A major benefit of social media is that it helps to humanize brands, and Livefyre’s header image is doing just that. Twitter Lists don’t get a lot of attention today, but the feature is actually a very efficient tool for agencies and community managers, as well as for your followers. And now that the number of lists you’re able to create has increased, many brands are using Lists to increase brand visibility, recognize creators and evangelists, and much more. Livefyre’s efforts to humanize its brand carries over into its use of Lists, where it highlights members of its team. This makes it extremely easy for fans to follow the people behind the company. The brand also uses the feature to recognize leaders in digital strategy through its Innovation Council list. When your content is primarily driven by marketing goals, it’s nice to carve out some space to recognize the people who make it all possible. Just like pinned posts on Facebook, Pinned Tweets are a great way to draw attention to noteworthy content. By anchoring a tweet to the top of your timeline, you’re ensuring that it’ll be seen every time someone visits your profile. 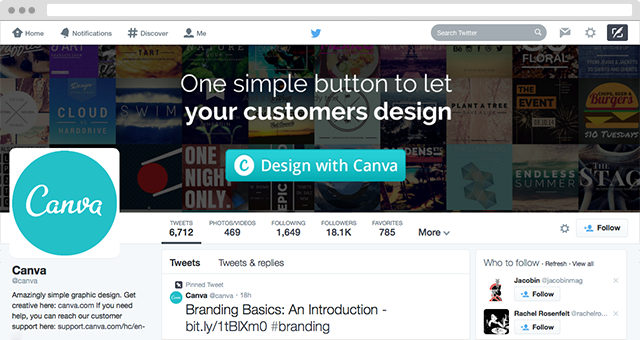 Canva, for example, has chosen a very relevant tweet to pin to the top of its timeline. Not only does it include a gorgeous image, but it features useful content for its target audience. Successful marketers are able to look at the feature sets of social networks holistically, integrating the old with the new and the small with the big. Talk with your social team to see how you can start using more of Twitter’s features to enhance not just your profile, but your broader campaigns as well.